Order your Makeup Kits as a Group. Easy Set Up & Ordering. School POs Accepted. Email to Get Set Up! Custom Makeup Kit Builder. It's Easy, It's Mobile, It's 24/7! Create Your Makeup Kit. Post Online for Parents to Order. Economical, Convenient, Performance Ready. They Love it! 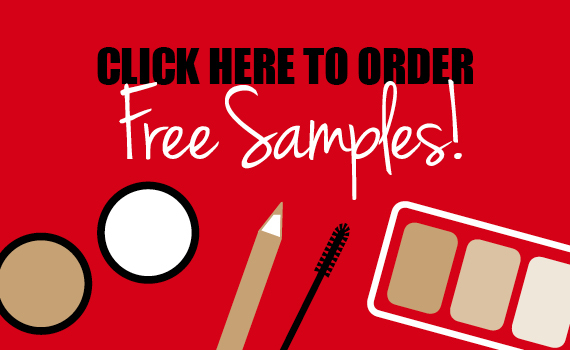 Sign Up for Free Makeup Samples. It's the best way to see how the colors will look on your skin & other team members. Make your color & price selections. Get ready to build your Custom Makeup Kit! Build a Custom Makeup Kit! For Cheer Teams, Dance Studios, Show Choirs, or any Performance Group! It's Easy! Use the online Makeup Kit Builder or Post on Your Makeup Kit for individual parent purchase. School PO's Accepted. 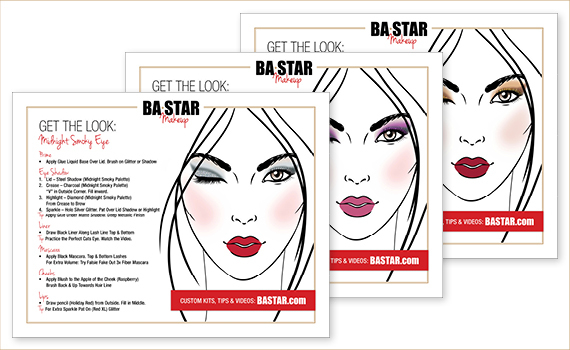 BA STAR custom Performance Makeup Kits come complete with everything you need to apply your Competition Makeup. FREE Clear Vinyl Zip Makeup Bag, a 5 PC Mini Brush Set, and Two Hole Pencil Sharpener. We know you want Fast, Free Shipping. Orders ship within 24 hrs of placements by USPS Priority Mail, or UPS Express Shipping Options are available. International Shipping rates apply. Tracking numbers are sent to verify shipment. Need it Fast? We've Got It! The biggest challenge for new Cheerleaders, Dancers or Performers is "How to Put the Makeup On". We know that Glitter Makeup, False Eye Lashes, Smokey Eyes are not something you wear every day. Application can all be challenging when you first start. BA STAR is here to help! Check out Our Makeup Artist Quick Tips, Face Charts & Videos designed especially for Cheerleaders, Dancers & Performers. A Makeup Artist Tips make it all less scary! Best of all We are Always Here to Help. BA STAR Philosophy: Every Girl Should Look & Feel Like a Winner! Matching Professional Cheer, Dance, & Stage Makeup builds confidence & self esteem. Affordability: At BA STAR we want every girl to be able to afford the extra polish of matching makeup kits. We sell directly to the consumer - studio, team, school, or parent - so that we can keep our prices low. Help & Support: The biggest challenge for new Cheerleaders, Dancers, or Performers is "How to Put the Makeup On". We know that Glitter Makeup, False Eye Lashes, Smokey Eyes are not something you wear every day & can all be challenging when you first start. So we have designed a set of tools to help. Our team of talented professionals have created Makeup Tips via Face Charts and Videos designed for Performers. BA STAR is the #1 Choice of Cheerleaders, Dancers & Performers. We believe and support your passion for Your Sport, Your Art and Your Spirit. As the Mom of a dancer - I am proud to be part of this wonderful competition and performance community. Order your Makeup Kits as a Group. Easy Set Up & Ordering School POs Accepted, Email for Set Up! Economoical, Convenient, Performance ready. They Love it! It's the Best Way to see "How the Colors will Look On Your Skin & Other Team Members"
For Cheer Team, Dance Studio or Stage! Its, Easy! Use the online Makeup Kit Builder or Post on Your Makeup Kit for individual parent purchase. School PO's Accepted. 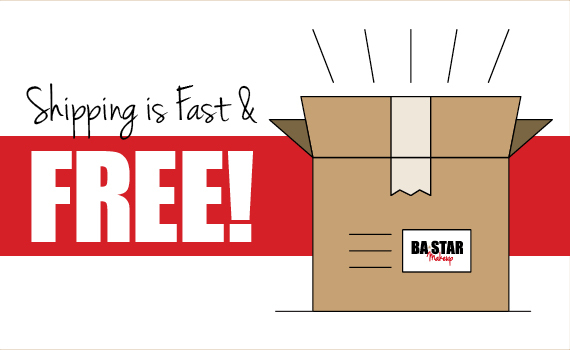 We know you want Free Fast, Free Shipping. Orders ship within 24 hrs of placements by USPS. Priority mail or UPS Express Shipping Options are available. International Shipping rates apply. Tracking numbers are sent to verify shipment. Need it Fast? We've Got It! Matching Professional Cheer, Dance & Stage Makeup builds confidence & self esteem. 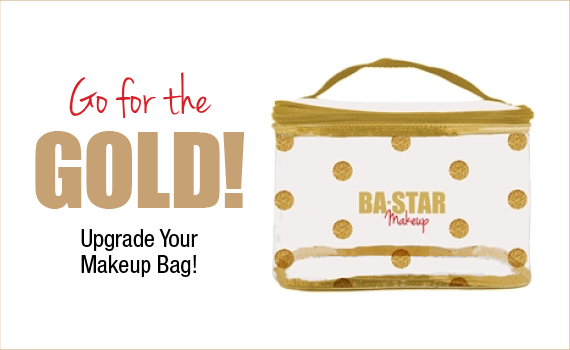 Affordability: At BA STAR we want every girl to be able to afford the extra polish of matching cheer & dance makeup kits. 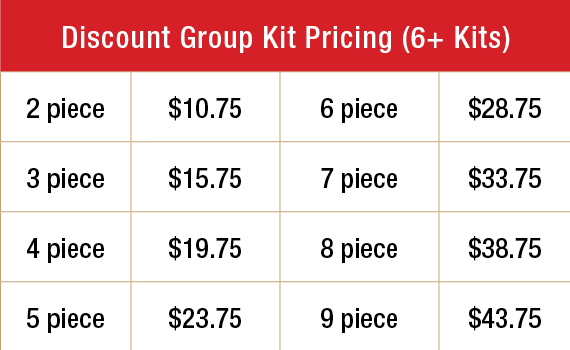 We sell directly to the consumer - studio, team, school or parent - so that we can keep our prices low. Help & Support. The biggest challenge for new Cheerleaders Dancers or Performers is "How to Put the Makeup On". We know that Glitter Makeup, False Eye Lashes, Smokey Eyes are not something you wear every day & Can all be challenging when you first start. So we have designed a set of tools to help. Our team of talented professionals have created Quick Makeup tips Makeup Face Charts, Makeup Videos designed for Cheerleaders, Dancers & Performers.